Team development interventions refers to facilitated processes and activities designed to improve team performance. High Performance Team development is usually used when an interdependent team needs to improve the way they work together to achieve growth and high results. High performing teams or HPTs comprise of individual strengths combined with the right leadership to deliver high-quality results that are aligned to organisational goals. High performance Teams are generally formed with highly skilled professionals from cross-functional areas and focus on achieving a common business goal. According to a McKinsey Report published in 2017, when members of a high performing team work together towards a common vision and achieving a common goal the financial performance increases by 1.9 times. The report also stated that employees are five times more productive when working in a High Performance Team than in an average team. Building an High Performance Team HPT is one of the proven business efficiency techniques that organizations cannot choose to ignore nowadays. We have developed a time-tested, proven system geared towards developing High performance teams through an experiential and structured learning process to adopt and apply practical principles that revolve around the core tenants of teamwork. Our HPT Team Development Programs takes a customized approach to its design and starts with the assessment of the learning objectives and desired outcomes of the specific organisation, industry, team and participants. The initial program flow starts with Ice breakers, Energizers, Trust Building Activities, Behavioral Contract, Ways of Working. 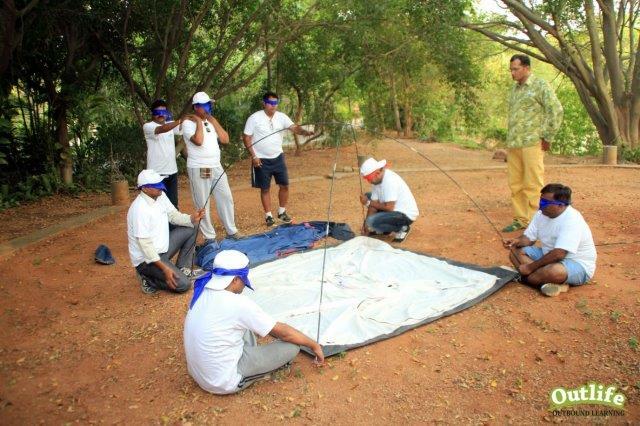 Later Experiential Learning Activities and Simulations are introduced followed by Sharing and debriefing. ​Psychometric tests focusing on the individual or teams is often part of the program. There are several proven, effective team development models used by our facilitators . Here are few commonly used team development models that we include as part of our structured learning and facilitation process. Absence of Trust, Fear of Conflict, Lack of Commitment, Avoidance of Accountability, and Inattention to Results. This model includes a team assessment to determine team scores on the 5 dysfunctions and provide your team with a sense of its strengths and areas for improvement. The Tuckman Team development model includes the forming, storming, norming, and performing stages. 3. Curphy and Hogan’s Rocket Model. The Rocket Model is based on research from hundreds of teams and provides sound, practical advice for improving group and team performance. ​The Rocket Model consists of eight components, which include context, mission, talent, norms, buy-in, power, morale, and results. Organizations are constantly faced with rapid change, disruption and complex problems and are increasingly turning to teams to provide breakthrough solutions and innovative ideas. Our Team Development program provides a robust framework for teaming and performance. ​It is loaded with trusted and action-oriented models and best practices to help the teams improve communication, solve problems, make decisions, reduce conflict, clarify multi-function work processes, and align around priorities and purpose. Contact us to create a High Performance Team.